Can Detroit's First Openly Gay Pol Save the City? Can Detroit Prevent a Return of 'Devil's Night'? Just one week ago, Charles Pugh was poised to become not only Detroit's first openly gay elected official, but its city council president when voters here go to the polls Tuesday. But the flashy former television reporter has an unpleasant new distinction: Pugh recently acknowledged that his three-story home near downtown Detroit has been foreclosed, raising serious questions about his business acumen at a time when this city is on the brink of financial collapse. Those revelations, as well as the disclosure that he failed to pay rent on an apartment at several points earlier this decade, have hardly helped Pugh's candidacy. In recent days, the editorial boards of both the Detroit Free Press and the Detroit News pulled their endorsements of him. (The Free Press wrote: "It's simply unreasonable for Detroiters to trust him with their city's finances after he so negligently managed his own.") Pugh dismisses the criticism, and says his financial troubles will actually endear him to voters in a city experiencing some of the most extreme effects of the national real estate crisis. "This is a personal issue I'm dealing with. The city council doesn't pay Detroit's bills," he says, adding, "So I'm very qualified for this job." 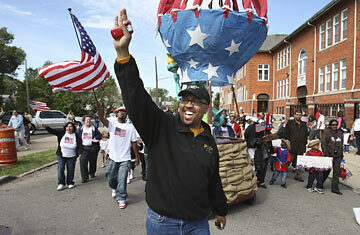 Other candidates might not recover from such a late hiccup, but Pugh, 38, has spent much of his life defying the odds. He grew up in one of Detroit's hardscrabble neighborhoods. His mother was murdered when he was 3 years old, and then, four years later, his father, an auto-plant worker, committed suicide. After being primarily raised by a grandmother, Pugh got a ticket out of Detroit with a scholarship to the University of Missouri's journalism school. He then built a successful television-reporting career in Indiana and Virginia before joining the local Detroit Fox News affiliate. In January 2004, Pugh emceed a conference on homophobia, at the Charles H. Wright Museum of African American History, a revered institution here. Local newspapers picked up the story, publicly confirming Pugh's homosexuality  something his friends and colleagues already knew. "I am a respectable member of this community. And I happen to be gay," he told the Free Press at the time. Earlier this year, he decided to be more than a chronicler of other people. "You can't be an activist and a journalist," Pugh told TIME one recent morning, sitting in the living room of his home, which is filled with giraffe sculptures. "So maybe I was in the wrong industry to effect the kind of change I want." The timing was good. Detroit has endured a period of political upheaval, the most notable case being the departure in disgrace of its previous scandal-plagued mayor, Kwame Kilpatrick. The city also likes to root for its own, so much of Pugh's narrative resonates with a certain segment of this city's electorate. The political newcomer won the primary election last August by more than 10,000 votes, beating the incumbent city council president. "Detroiters are so thirsty for leadership," says Mildred Gaddis, a popular Detroit radio host and one of the most astute observers of the region's politics. But the city's jaded voters have had their share of politicians who are more style than substance, and Pugh's talk of bringing change to the city is sometimes vague and simplistic. He has suggested putting teams of volunteers on Detroit's streets to give residents various facts about the city. He has floated the idea of bolstering neighborhood-watch clubs to reduce crime. He has pledged to create a website to improve citizens' engagement with elected officials. "You walk through neighborhoods and people say, 'I've never seen the people I elect around here,' " Pugh observes. And so he's offered to have dinner at least once a week with a different Detroit family. That doesn't sway some of the city's more committed voters. At a recent fundraiser in Palmer Woods, an upscale Detroit neighborhood, Pugh told the crowd of plans to create a room for the city council's president to hold press conferences, modeled largely after the White House press-briefing room. Never mind that Detroit is struggling to resolve a budget deficit of at least $275 million. "P.r. is part of the job," Pugh said. But the host, Mary Ellen Gurewitz, a respected Detroit attorney, pressed him on issues of procedural and financial matters, and was hardly impressed. "I don't think he knows anything about policy, and how you deal with those issues," says Gurewitz, whose neighborhood is one of the few in Detroit where residents actually vote in large numbers. He has been careful not to delve into issues like gay marriage, partly because it typically doesn't figure into a city councilor's portfolio. Still, he recalls one influential Detroit pastor saying, "We like you, but you pose a problem for the clergy: homosexuality is a sin in our book." Yet hardly any ministers have publicly denounced his candidacy. "People have whispered things about Charles Pugh's homosexuality that they wouldn't dare say in public, partly because they don't want to be singled out," says Gaddis. Yet Pugh, who doesn't hide his ambition to be mayor someday, insists his homosexuality matters little to the electorate. "They don't care that I'm gay," he says. "People trust me. And they know I want what's best for Detroit."